Brownells has a helpful Instructional Video showing how to attach a one-piece scope mount and dove-tailed rings on a rifle. Brownells tech David Bennetts shows how to degrease the parts properly, torque the screws correctly, and adjust scope placement for proper eye relief. In the video, Bennetts installs a conventional ring set with dove-tail front ring + windage adjustable rear ring. We actually prefer a non-adjustable double-dovetail installation. Double dovetails provide a rock-solid, low-profile installation that works well on hunting rifles–you never have to worry about the rear ring working loose. Burris makes double-dovetail sets with Signature polymer inserts. Offset (assymetric) inserts allow “pre-loaded” windage correction in the rings themselves. Hence you don’t need an old-fashioned rear ring that slides from side to side for gross windage adjustments. This video is just an introductory clip. It does not cover ring lapping or more sophisticated methods of reticle alignment. We recommend, when mounting the scope, to use multiple bubble levels and a plumb line to ensure that the scope’s cross-hairs are truly aligned properly. With some commercial scopes, unfortunately, the reticle is canted up to 3° internally relative to the turrets. With such a scope, you CAN set the reticle square, but then your turrets will be canted relative to the receiver. That creates issues when shooting at long range. 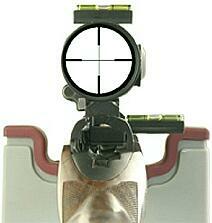 Accordingly, if your scope has a badly canted reticle, you should send it back to the manufacture for warranty repair. Share the post "Brownells Offers Scope Mounting Video"
In 2007, Ruger launched its new polymer-framed, SR9™ striker-fired 9mm pistol designed to compete with the Glock, Springfield XP, and S&W MP handguns. The gun was slim, with a comfortable grip. Unfortunately, Ruger has “determined that some Ruger SR9 pistols manufactured between October 2007 and April 2008 can, under certain conditions, fire if dropped with their manual safeties in the ‘off’ or ‘fire’ position.” Accordingly, Ruger has issued an SR9 Recall Notice. To correct the problem, a new trigger group must be fitted by Ruger. If you own an SR9, submit contact info on Ruger’s SR9 Recall Registration Page. Once you register, Ruger will send you a shipping label and shipping box so you can return your pistol to us FREE of charge. After installing the new trigger group, Ruger will return the pistol (at no charge), along with FREE extra magazine. For more details, or to submit your info by phone, call the SR9 Recall Hotline, 1-800-784-3701. Share the post "Ruger Recalls SR9 Pistols"